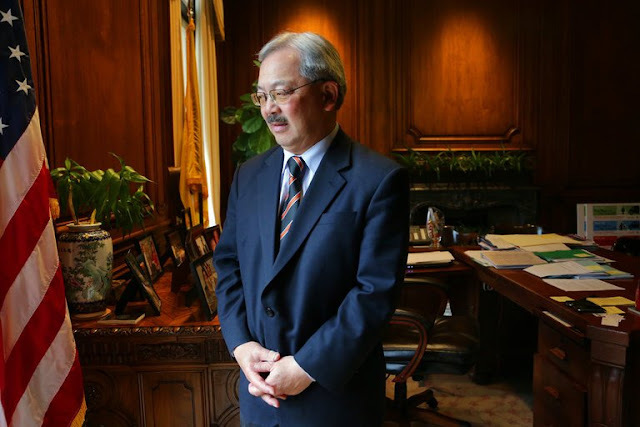 San Francisco Mayor Ed Lee died suddenly this past week at the age of 65.
the Facebook founder, the Zuckerberg San Francisco General Hospital and Trauma Center. He suffered the attack while shopping at a Safeway supermarket at 10:00 PM last Sunday evening. I really can't go into much detail about the policies he promoted because for a politician he was a quiet man, not an aggressive self-promoter. After learning of his death, I told a friend at the gym, "Ed Lee died." His response, "Who?" It is difficult to think that if California Governor Jerry Brown had died, another man with a common name, and I had said "Jerry Brown died" that the response would have been "Who?" In January 2011, Lee was appointed by the Board of Supervisors to serve out the remaining term of former Mayor Gavin Newsom after Newsom resigned to take office as Lieutenant Governor of California. On November 8, 2011, Lee won the election to serve a full term as mayor. He was re-elected in 2015. He most certainly had to have had the support of crony constituencies to win election twice but he certainly did not rub his power into the face of the average resident of San Francisco. I can't think of one insane lefty policy idea that was launched by him. Such a policy launch would most certainly have garnered him more notoriety and power in this city by the bay. He was a rarity in San Francisco where it seems each member of the city's Board of Supervisors attempts to outdo the other members with one crazed interventionist proposal after another. The city is still under a McDonald's Happy Meal ban thanks to the Supervisors. Ed Lee was not like that. He should not be considered a libertarian but he led a revitalization of Mid-Market, San Francisco, providing companies that moved into the area with a temporary exemption from paying San Francisco's 1.5 percent payroll tax. The break amounted to $34 million in 2014 alone. He also was a key supporter of the Ellis Act, which allowed private property owners to regain control of their properties and evict tenants that they no longer wanted on their properties. That said, he was an advocate for an increase in San Francisco's minimum wage. It was probably something he had to do to stay in power in the People's Republic of San Francisco. All said, Lee seemed to have something of a free enterprise bent in a city that doesn't appreciate free enterprise. He kept his head down, didn't propose outlandish new interventions and pushed for free enterprise where he could. It would be a great starter model for future mayors of this city but I fear what is to come in this city of fog and lefties. Former San Francisco Mayor Willie Brown reminds me of another great thing Ed Lee did, he smashed the taxi monopoly which made it impossible to get a taxi almost anywhere in the city. Everyone on all sides of the political spectrum has something nice to say about the guy. Everyone, that is, except the taxi drivers. They still blame Ed for the flood of Uber and Lyft cars that are killing their livelihoods. I thought you were going to say the model is for politicians die at an early age.